dnipremiumnames.com are the new spam kid in the block. These bunch of retards have been sending e-mails from various other fake domains which they have created and keep creating just to send out spam e-mails. First I ignored them and marked their e-mails as spam. 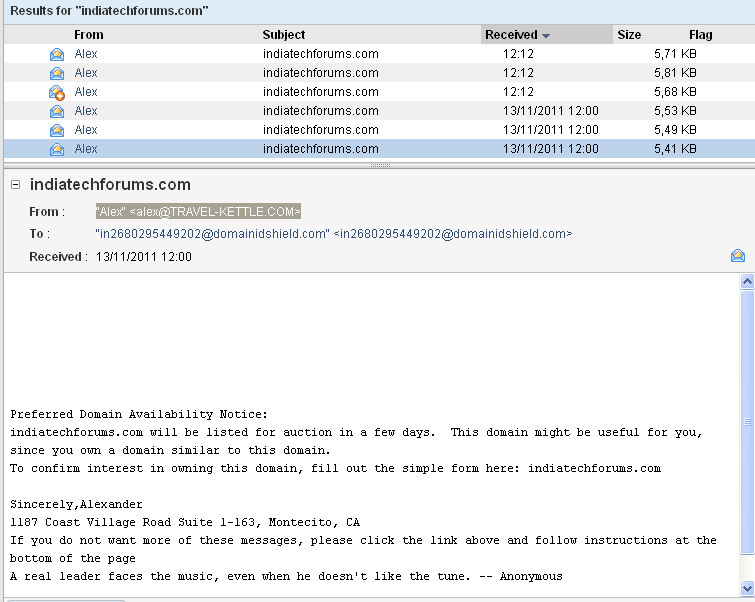 However since they keep sending e-mails from new domains each time the spam block doesn’t work. I’ve sent them e-mail to stop spamming but it seems these guys are really deaf and dumb. indiatechforums.com will be listed for auction in a few days. This domain might be useful for you, since you own a domain similar to this domain. There are no links in above and below to unsubscribe. Their modus operandi is simple, they pick up a domain from their portfolio find out the onwers of similar domains and run their spam machine to send spam e-mails. Domain Names International (DBA InTrust Domains), is based in Colorado Springs, CO.
You can reach us by phone during US business hours at 1-303-353-1917 or you can email us at support@intrustdomains.com. I contacted their support from the website (see the e-mail trails below). They removed one e-mail but still there are hundreds of other e-mails which they send spams to. It is not possible to find out all those e-mails as it is not mentioned in the e-mails. So at the end of all these I still keep getting 10s of such spam e-mails on weekly basis. Thank you for the info. Your email address is already removed from our email queue. Please let us know if we can be of further assistance. I’ve been receiving tons of such e-mails. Could you stop spamming? These guys are outrageous! I am being spammed to death by them and nothing seem to work. I honestly do not know what and where to go from here. We can’t do anything else than to mark their e-mails, domains, IPs as spam and have faith in spam filter to bin such e-mails. My spam filters has already started to bin their e-mails. That is the best we can do from across the Atlantic. They are in USA and hence far far away from the reaches of English law. We can’t do anything with them, they are protected by uncle Sam, guarded by marines, secured by the Pentagon and not to mention their nukes is always a big deterrence. And these guys know this fact very well, that is why they don’t have any shame in sending spams overseas. I’ve no more ideas on how to stop them. Just mark their e-mails as spam and keep quiet. You don’t want to waste your precious time on these thugs? Do you? Getting tons of spam from them as well. In addition to InTrust, DotStrong appears as the Registrar in a lot of the “Alex” URLs. Further, ENOM, Inc. is listed as registrant in the URLs that don’t list another URL e.g. dropsave.com as the registrant. Seems that the registrant info violates ICANN protocol.